Hi, my name is Guillermo Guerrero. I was born in San Antonio, Texas and raised here in Milwaukee. I struggled as a student in my elementary years. However, with the support of my teachers and family I was able to excel in my academics in middle school. Now, I am very fortunate to be a Rotary Scholar. I want to thank the RCM Scholarship Committee for giving your support to help serve others. Because of your time and generous contributions you are making college possible for students like me. 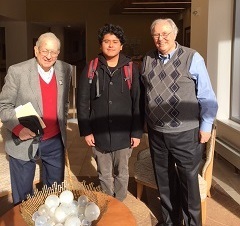 I am also thankful to have two of the best mentors, George Solveson and Art Wasserman! They have always been there to support me and encourage me to stay on top of things. I am thankful for everything Rotary has done for the scholars and I, and we appreciate the time you all make to help us.